The best part about living in the South is our diverse culture. We’re a young region, like the rest of America, but we’ve had to rebuild after Civil War, Great Depression, multiple recessions and that darn Boll Wevil. Why not promote the nice things about living in the South? That’s what PrettySouthern aims to do, and now we have a partner in pleasantry: Southern Nice. Southern Nice is the brainchild of Jeff Burns: a native Southerner, graduate from Georgia Tech, and all-around gentleman. 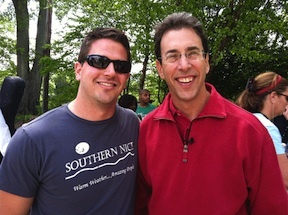 His company launched in March 2011 and has already received hundreds of orders for his products bearing the Southern Nice logo. They started out with two tee shirt designs and in their first week sold almost 100 shirts plus a bunch of koozies and croakies. To date, Southern Nice has sold several hundred shirts in just a few months. What’s better is Southern Nice donates 50 percent of their profits from sales of their “city” shirts. The company has tee shirts dedicated to two great Southern cities, Atlanta and Nashville, with the proceeds going to Children’s Healthcare of Atlanta plus Hands on Nashville. Southern Nice plans to roll out designs for Charlotte, Charleston and New Orleans by then end of 2011 with proceeds from the sale of those shirts also going to charity. The products are fantastic. Comfy, soft shirts (produced in part by local Atlanta company IceBox), plus nothing says “I’m a Southerner” like a pair of croakies or a coozy with the Southern Nice logo. “It doesn’t matter if your black, white, Asian, or Hispanic…it’s the way you smile we can tell you’re from the South. Our Southern history, our culture is enriched by diversity, and other regions can’t say that. Living in Atlanta especially, we want everyone to feel like they’re Southern. For more info on Southern Nice, check out their website or their Facebook page. Do you call yourself a Southerner? Are you nice? Then these shirts are for you! We’d like to present our first PrettySouthern Prize! The FIRST TWO people to comment on this post will get a FREE SOUTHERN NICE TEE! The NEXT 10 folks will get a FREE SOUTHERN NICE COOZIE! Good luck y’all! Love the tees! What a great way to use local services, support local charities, and celebrate local culture. “It doesn’t matter if your black, white, Asian, or Hispanic…it’s the way you smile we can tell you’re from the South.” = Right on!